A clear signal to the technology dinosaurs. Solar is cleaner, faster, and smarter. 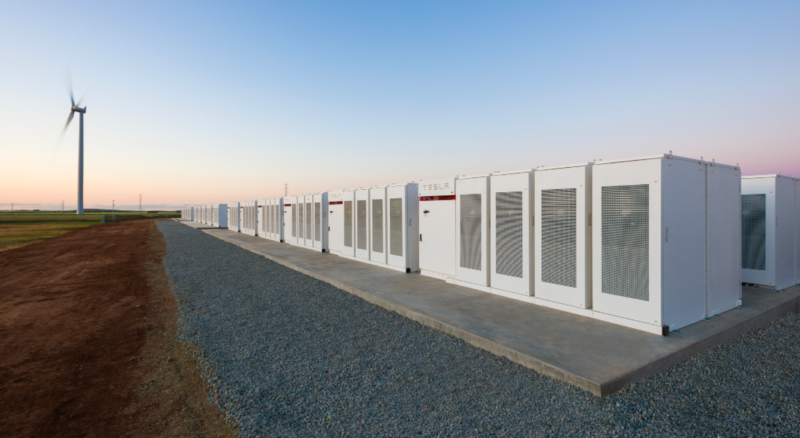 The mega battery Tesla installed in South Australia has once again proven its worth by protecting a grid from a coal plant failure, according to reporting from Renew Economy. What’s even more impressive is that the battery was activated in mere milliseconds, even before the coal plant in question was finished going offline. The Tesla battery was able to respond, stabilize the grid, and finally go back offline before the backup generator contracted to do the same even finished starting up. Tesla’s massive 100MW/129MWh lithium-ion battery officially came online at the beginning of December. Its implementation was a response to a series of blackouts over the summer of 2016 — meaning it was designed to handle events just like this. The region gets 40 percent of its electricity from wind farms, which is an excellent utilization of renewable energy. Yet the wind is not always blowing, so contingency plans need to be put in place when the supply does not meet demand. The battery allows power to be collected at non-peak times for use when that demand reaches beyond the amount of power that is actively being supplied to the grid. As we can see with this latest event, the battery has more than one way to prevent outages. That’s not to say that the Tesla battery prevented a blackout — at least, not in this particular case, as the coal-powered backup did kick in as it should have. Still, the speed at which the battery was able to swoop in and save the day is proof that the technology can be an important addition to power grids around the world. Batteries are one of the most important technologies to ensure that the march toward a renewable energy future keeps pace with the realities and limitations of using green power generation. Generating energy from untamable natural sources such as the wind or the sun does allow for a degree of unreliability in grids that heavily rely on such sources. Solar and wind farms cannot generate energy when the sun is hidden by clouds or the wind simply isn’t blowing, but batteries have the ability to pull grids through these instances by making up those temporary differences. Traditionally, any such gaps are filled in by fossil fuel burning “peaker” plants, which only come online in the event of a shortage. While they are not working with Tesla, California’s Public Utilities Commission has begun working on supplying Los Angeles with a battery to replace such plants, further deepening their commitment to renewable energy. Tesla isn’t the only company advancing the capabilities of renewable energy but it certainly is a major player. A company rep has even said that Tesla is a “one-stop shop” for sustainable energy. Tesla products already make it possible to fully integrate the home’s electrical needs by marrying their solar roofing tiles and home battery systems, and they’re even expanding that integration into the very grids that power the neighborhoods around those homes. The speed and capabilities of Tesla’s battery is a very good sign for the technology’s expansion and the potential for renewables to one-up coal power. Adding the proven technology to more grids will continue to push the integration of renewable energy forward. The Hidden Cost of Bitcoin? Our Environment.